drilling a hole in the roof of the trailer. This is the most direct solution as you get the antenna exactly where you want it with minimal run distance. 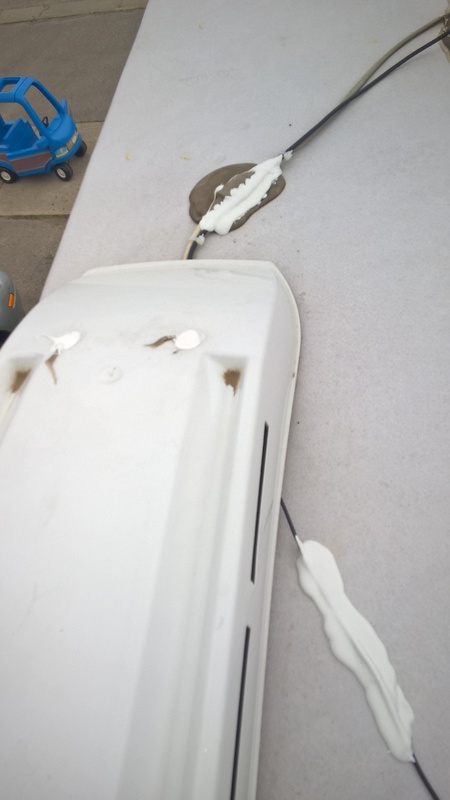 The big downside is that you are putting a hole in the roof of your rig, which you now need to seal and keep sealed. You could also run into issues on resale. You also do not know what you are drilling into, what if you hit a wire, you could electrocute yourself or just not be able to fix your error without ripping out the whole roof. Another option is to run thru a window or door. This is ideal for a temp solution, but messy for longer term. Another possible option is to use an existing hole in the roof. This can sometimes require more antenna wire as you have to go to the hole as opposed to the hole coming to you. A couple of popular ways to do this is to go down between one of the holding tank vent pipes in the roof. This requires little room and all you have to do after is recaulk around the vent pipe. The one issue is where the pipe goes and how will you access the wire on the inside. The other option is going thru the fridge vent. 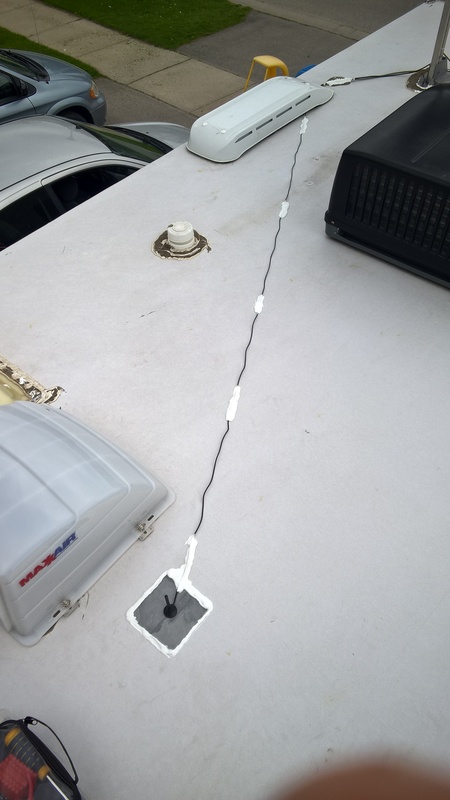 Most RV fridges have a vent in the roof that can be removed and you can then drop the wire down a large void and then bring it into the RV. In my case I choose to go thru the fridge vent. I did this for a couple of reasons. First it is easy to work in the void as it is so big. Also I had my entertainment shelf by the TV and Radio right beside the fridge. This allowed me to go thru the side of the fridge void and out into the shelf. The other part of this project is where to mount the two antennas. For me, I wanted to mount a fiberglass WIFI antenna and a small Wilson Sleek antenna somewhere on the roof. For the sleek the most important factor was getting it 6 feet from the amp as per the manufacturer specs to avoid oscillation (like mic feedback). For my rig this meant putting it near the very back of the trailer. I was fine with that as the amp had 26db of gain, a roof mount was sufficient. For the WIFI antenna, I really wanted to put it on the Batwing TV antenna arm. 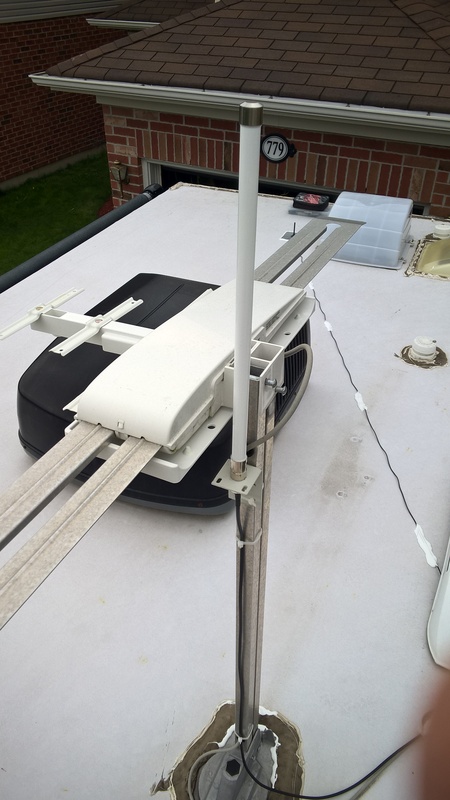 This would get it about 3-4′ above the roof, which was more important for an antenna that only gave about 8 db gain. The Batwing was also right in front of the fridge vent, making the distance for the WIF cable very short. The first step to install involved removing the cover from the fridge vent. This is done by peeling off the Dicor from the 4 screws on the top of the fridge vent cover then unscrewing it. This will reveal a screen cover over the void. Depending on the thickness of the cable ends, you may need to cut a few links in the screen to make an opening big enough. The next thing is to lower the antenna wire down into the void. 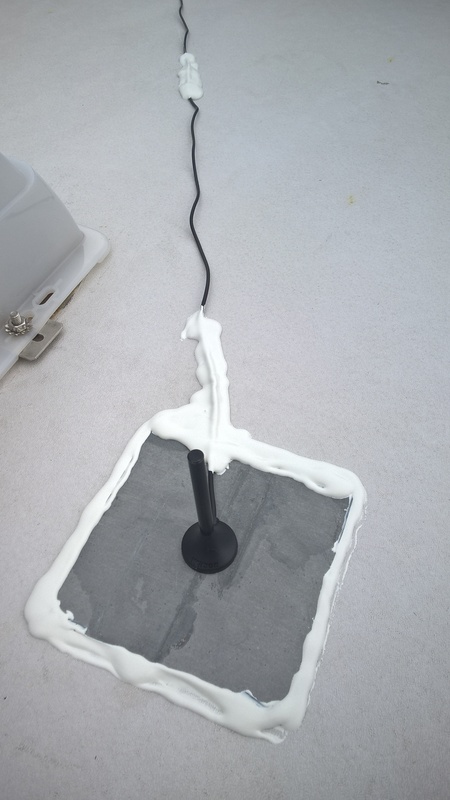 After that is the tricky part, this involves drilling a hole into the void from the inside of the trailer and using a coat hanger or fish to snag the wire and pull it into the trailer. This can be easier if you use a piece of string and tape a loop onto the end of the wire. 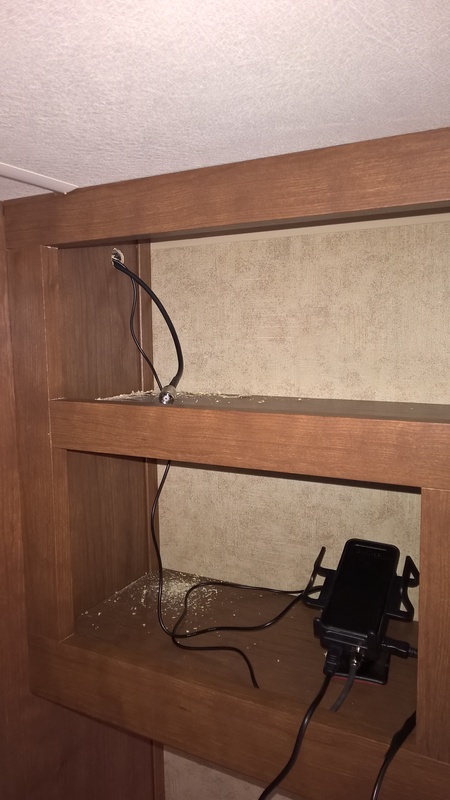 Once you have the end of the wire into the RV, you need to start installing the antennas. In my case it meant tie strapping the bracket to the Batwing for the WIFI antenna then screwing the antenna wire into the base. For the Cell antenna, it just sits on the ground plane. To finish up, tie straps any loose wires on the Batwing arm and make sure you use lots of Dicor to seal around the ground plane and to secure the wires to the roof of the trailer. 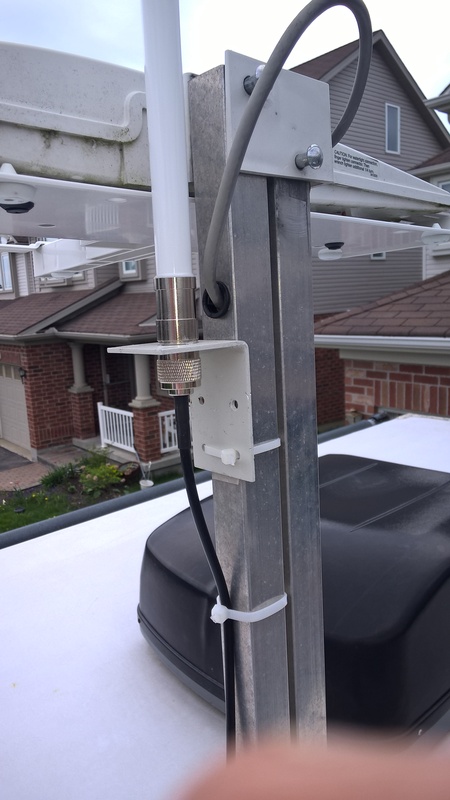 Make sure you create a drip loop at the bottom of any antenna wire that is raised above the roof (like my WIFI antenna) as when it rains, the water will follow the wire down and if it is straight, it will follow it right into the void and cause mold. A drip loop is just a low point between the vent and the Batwing for the water to go down to the roof. Inside the trailer I sealed the hole to the fridge vent with Electrical Conduit putty. It is like modeling clay, but fireproof and is easy to fill a small hole. Note I replaced the tie straps with better ones later as I did not have the right ones when I did the initial install. Use black ones, as they are UV resistant. White ones will fail after about one season.